Allegro’s RomPlug suite of development toolkits offers your engineering team flexible and robust technology to build state of the art UPnP and DLNA enabled consumer electronics and mobile devices. In addition to Allegro’s core RomPlug UPnP / DLNA technology, Allegro offers a variety of application-specific toolkits to create DLNA Digital Media Players (DMP), Digital Media Servers (DMS), Digital Media Renderers (DMR) and Digital Media Controllers (DMC). Additionally, Allegro supports the DLNA specified link protection protocols with the RomPlug DTCP-IP and the latest interoperability guidelines (VidiPath™) with RomPlug VP. Allegro’s RomPlug IGD toolkit provides the UPnP frame for creating an Internet Gateway Device. Your engineers will save time and money with Allegro’s proven and stable implementations of industry standard protocols that comprise the UPnP and DLNA architecture. Using the RomPlug Device Toolkit, your engineering team can create a broad range of UPnP enabled products. On one end of the spectrum, your team can easily create a product that fully complies with the UPnP Forum’s definition of a Basic Device and can be easily discovered and controlled with UPnP technology. On the other end of the spectrum, sophisticated servers and renderers can be built to make full use of UPnP Control and Eventing capabilities based on embedded XML, SOAP, and GENA protocols. Delivered as ANSI-C source code, the toolkit provides the Discovery, Description and Presentation components of the UPnP architecture which are built upon a highly portable and field-proven abstraction layer enabling it to work with any OS or TCP/IP stack. Your engineering team will save months of development effort when building a fully certifiable UPnP Control Point with the RomPlug Control toolkit. 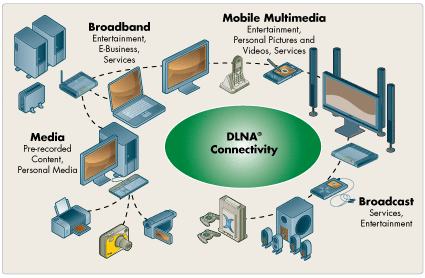 This toolkit provides a comprehensive solution for products that will discover and control UPnP or DLNA devices by implementing the full Discovery, Description, Presentation, Control and Eventing layers of the architecture. All RomPlug toolkits include the PlugBuilder Compiler, which speeds your product development by simplifying the SOAP parsing and framing process. 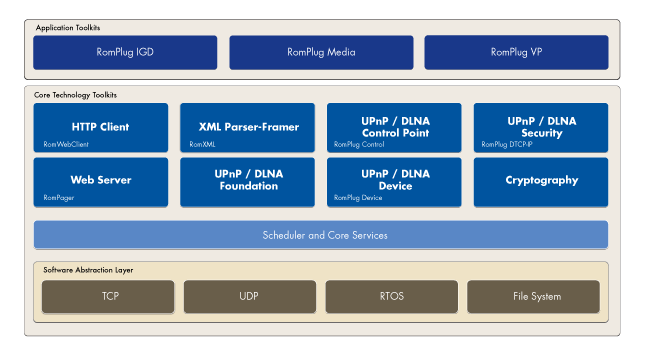 PlugBuilder processes the device and service templates defined by the UPnP Forum Working Group to create application stub functions as well as SOAP parsing and framing control data. At run-time, RomPlug automatically parses incoming SOAP messages, delivering data structures to the application functions. This tool allows your application developers to focus their development time on their device-specific functions rather than the details of SOAP message parsing and framing. The RomPlug toolkits provide a simple development model for your engineering team. The application programming interface (API) calls to control the RomPlug toolkits provide a simple yet comprehensive method to construct powerful UPnP architecture devices and control points without getting involved with the complexities of the UPnP protocols. Sophisticated compiler option flags allow maximum code-sharing to provide the smallest possible footprint and best performance. Designing unique value-added capabilities into your product is critical to market differentiation. Allegro’s RomPlug toolkits offer access to full web technology allowing your development team to utilize the RomPager Advanced Web Server, RomWebClient and RomXML toolkits outside the context of UPnP support. Your engineering team can jointly leverage the field-proven UPnP technology in addition to offering design flexibility to provide the unique value of added functionality. All RomPlug Toolkits are highly portable across RTOS and processor families. Delivered in ANSI-C source code, all products utilize a field-proven abstraction layer to enable portability with any RTOS, TCP/IP, and file system environment. Interface files for leading RTOS environments are provided.